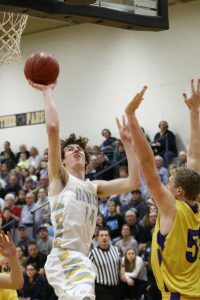 Six years since their last state tournament appearance, the Lynnville-Sully boys ran away with what had been a close game with Martensdale-St. Marys on Saturday to claim the Substate 6 Championship and a ticket to the state tournament. “It was a great night to be a Hawk!” said L-S Coach Nick Harthoorn, who will take his third trip to state as a coach. L-S came into the game at Knoxville with a 23-1 record, while the MSM Blue Devils sat at 18-6. In the end, the No. 5-Hawks pulled ahead to a solid 72-52 victory to secure a spot at the state quarterfinals on Monday, Mar. 6. Junior Brevin Hansen goes up for a layup against Martensdale St. Marys. The Hawks had their work cut out for them to slow down a 6’8’’ center from MSM, Brady Gavin, who scored 24 points despite getting his third foul in the second quarter. Gavin headed to the bench with 4:55 left on the second-quarter clock, and L-S used this disruption in their opponent’s offense to create a gap in the second quarter. The teams had been tied at 14-all after the first period, but the Hawks took a 37-24 lead into halftime. The Blue Devils refused to go down without a fight. With Gavin back in play, MSM’s 10-2 run at the start of the third quarter narrowed the Hawks’ lead to just 39-34 about halfway through the period. With just eight minutes to go, L-S was up by 10, 49-39. The Hawks were able to get some shots to fall early in the final quarter and then went eight-of-10 from the charity stripe as they pulled away to a 72-52 victory. Balanced scoring was key for the L-S boys in the game. The Hawks also did a better job of shooting three-pointers, going five-for-eight, compared to zero-for-four for MSM. “We did a good job attacking the rim all night long. We were able to get them into a little foul trouble and convert from the line,” Harthoorn said. Junior Tanner Foster gets off a shot down low. He scored 16 points versus MSM. The Hawks had four players in double digits, and senior Tyler Van Zante led the way for the second game in a row with 17 points. Brevin Hansen, Jesse Van Wyk, and Tanner Foster, all juniors, each had 16 points. “We did a good job of spreading the shots between a lot of guys. A lot of guys scored in double digits, which made it easier for me to get to the rim and finish. We popped the ball around and had good movement off of the ball to set up our shots,” said Van Zante. The leading rebounder for the Hawks was Van Wyk with 11. Van Zante tacked on five boards, and junior Corey McCoy had three. “We knew that rebounding was going to be a focus in this game because they have a really big boy who gets a lot of offensive rebounds. I thought we did a good job on the boards, but it’s something we could do better as a team moving forward,” said Van Wyk. Van Wyk also led the way in assists with four. Van Zante and Hansen each tacked on two more assists. The No. 5 Hawks will play No. 4 Gladbrook-Reinbeck in a state quarterfinals game at 10:30 a.m. at Wells Fargo Arena on Monday, Mar. 6. L-S sophomore Rylan James lifts off a shot above his defender. For L-S fans who can’t make it to Des Moines, the quarterfinals will be live streamed on www.ihssn.com. To watch the semi-finals and finals, you must be a Cable, DirecTV, or Dish satellite subscriber with CSN as part of your subscription package. However, audio stream is free online for semi-finals and finals on the website listed above. 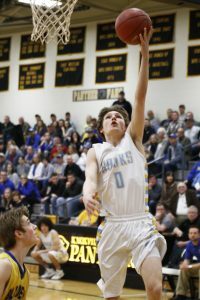 The stakes were high last Thursday when the Hawks took on their rival from the east, Montezuma, for a chance to win the district championship for the second year in a row and advance to the Substate game. The Hawks got down early at Newton but came back and won the District 11 Championship, 52-43. L-S took the opening tip and struck first with junior Jesse Van Wyk scoring on a drive to the basket. Montezuma came down on their first possession and made a three-pointer. The Hawks answered on their second possession with senior Tyler Van Zante driving from the left baseline. Monte answered with another three and continued the first-quarter shooting hot from behind the arc, while the L-S boys continued to make inside shots. The Hawks couldn’t keep up with Montezuma and ended the first quarter down, 18-13. Senior Tyler Van Zante puts up two points under pressure. In the second quarter, L-S chipped away at the deficit and played strong defense. By halftime, the Hawks had held Monte to just six more points and were in the lead, 25-24. L-S. With 5:00 left in the third quarter, L-S had extended its lead to seven points. The Braves closed in on the lead a little until Van Zante answered with the Hawks’ only three-pointer of the night, with a minute left in the quarter to give them an eight-point lead. The Braves made a shot in the last minute to close the score to 39-33. 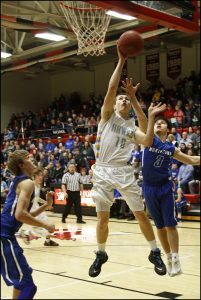 In the final period, Montezuma continued to narrow the L-S lead, and with 2:32 left, the Braves had tied the game at 43. The Hawks gained the lead with sophomore Rylan James making an inside shot. L-S buckled down and made a stop. On the following possession, the Hawks benefitted from a technical foul called on Montezuma’s head coach. Van Wyk made one of the two free throws, and the Hawks took advantage of the momentum swing, never allowing the Braves to score again and taking the win, 52-43. 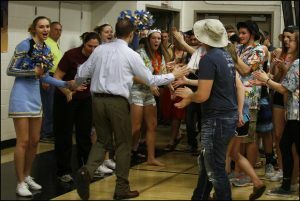 A very pumped-up student section high-fives L-S Coach Nick Harthoorn as he exits the gym following the big win over Montezuma. Scoring leaders were Van Zante with 16, James with 10, and Hansen had nine. L-S out-rebounded Monte, 33-24. The leading rebounders were James with 11 and Van Wyk with nine. 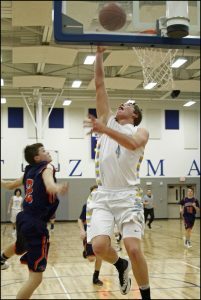 District play for the Lynnville-Sully boys began on Tuesday, Feb. 21, with the Hawks traveling to play Colfax-Mingo on a neutral court in Montezuma. This was the third match-up between the two teams this season. 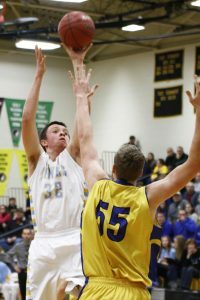 Back in mid-December, the Hawks defeated the Tigerhawks at Colfax, 68-38. The Hawks won again at home, 78-26, at the end of January. In their final meeting of the season last week, C-M came out stronger this time, surprising the Hawks, but by sticking together and overcoming adversity, the L-S boys ended on top again, 56-39. Jesse Van Wyk completes a break-away layup against Colfax-Mingo on Feb. 21. Leading the team in scoring was junior Jesse Van Wyk with 14 points; six of those points were free throws and the rest came from the paint. Right behind Van Wyk was junior Tanner Foster with 12 points. Foster had nine points from beyond the arc, two points in the paint, and one free throw. Having an unusually low scoring game, junior Brevin Hansen only scored seven points. Hansen made two free throws, one three-pointer, and two points inside the arc. “It wasn’t our best game by far. Not all of our shots were going in that we expected to, but we played hard and ended up on top again,” said Van Wyk. Sophomore Rylan James led the team in rebounds again, with four offensive and two defensive. Junior Corey McCoy, Hansen, and Foster each had five boards. Stealing the ball the most for the Hawks was senior Tyler Van Zante with four. Van Zante slightly hurt his arm in the first half but played through the pain. Sophomore Tyson Vander Linden and Foster each had two steals. Senior Ryan Hofer, McCoy, and Hansen each contributed a steal for the Hawks. Hofer also had two blocks.